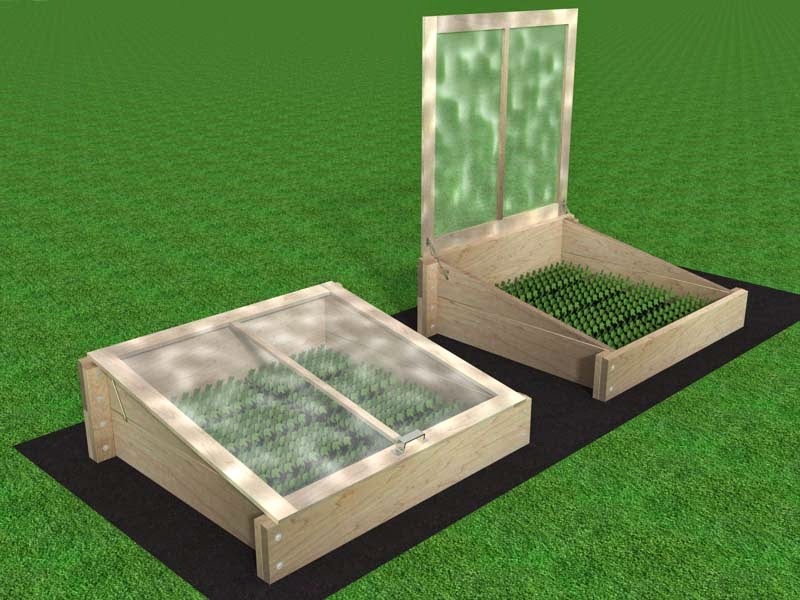 Wish you had a cold frame for starting seeds or extending your growing season but you don't have the room for them? 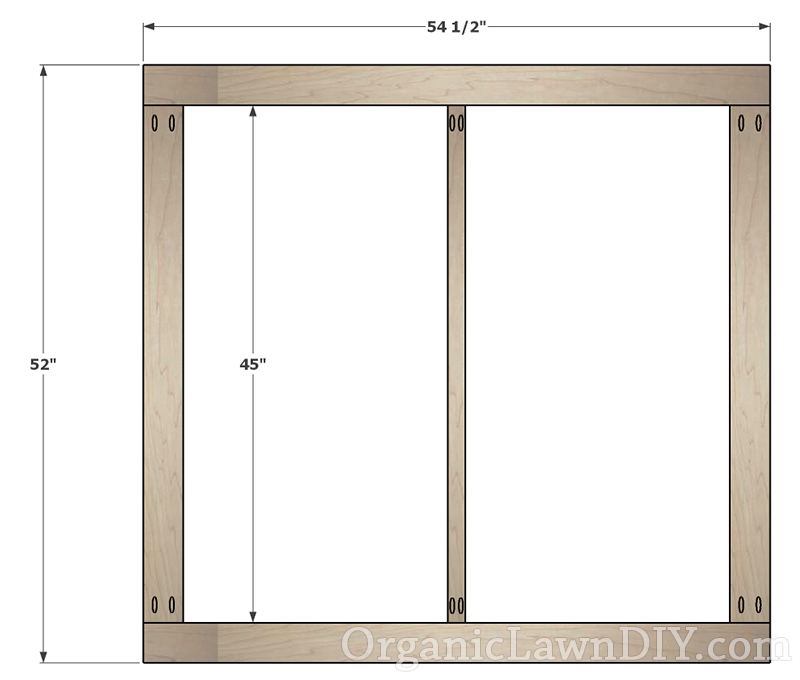 Here are step-by-step plans to make some DIY cold frames that can be taken apart to save storage space when not in use. 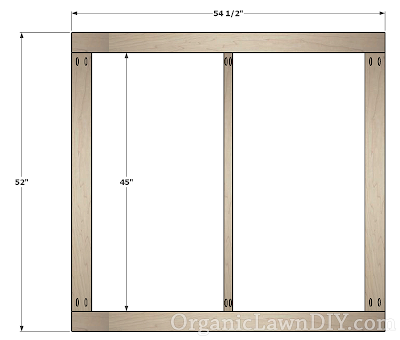 The cold frames are about 4' x 4' and can hold up to 8 standard 1020 trays. When you're not using the cold frames that can be taken apart and only take up about 20" x 60" of floor space in your garage, shed or basement. Each side consists of 2 48" long 2x10 boards, 4 boards per cold frame, 8 total for 2 cold frames. Attach the boards using glue and pocket hole screws drilling from the bottom up to the top 5-3/4" apart starting from the center of the board. Leave off 1 of the screws. For the left side, leave off one screw from the left, for the right side leave off one screw from the right. Each side has one 9" tall 2x4 (front) and one 17" tall 2x4 (back) wings. Drill holes big enough to accommodate your bolts as shown and fasten them to the Side using 2-1/2" pocket hole screws and glue. Make sure the wings are installed on the side that doesn't have the pocket hole screws that were used to join the 2 2x10's together. The left and right sides are mirror images of each other. Make sure the smaller (front) wing is secured to the end where the pocket hole screw was skipped in the previous step. You can change the hole spacing if you like just make sure there are at least 2 holes for the bolts that go into each 2x10 back and 2 pocket holes to each 2x10 side. Clamp the front and back to the 2 sides and drill holes through the holes on the wings to create holes on the back and front boards where the bolts go. Install the bolts with a washer on each end and tighten down the bolts making sure everything is square. To get a nice, tight fit with the lid we need to bevel the top of the front and backs. 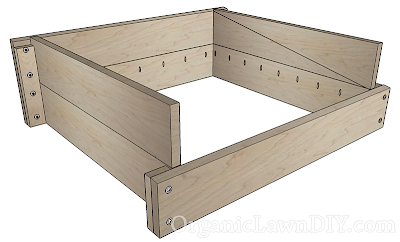 Lay a piece of scrap board over the cold frame so it's resting on the back. 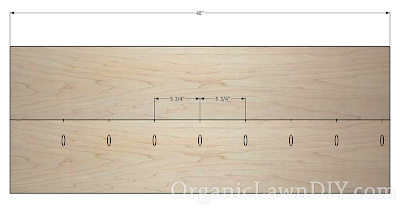 Place your circular saw flat on top of this board, with the wide part of the shoe on the scrap board and adjust the bevel angle on your saw until it's parallel with the back. This will set the saw at the correct angle for the bevel cuts. With the saw at the correct angle trim off about 1/8" off the top of the front and back to create the bevels. They should look something like this. 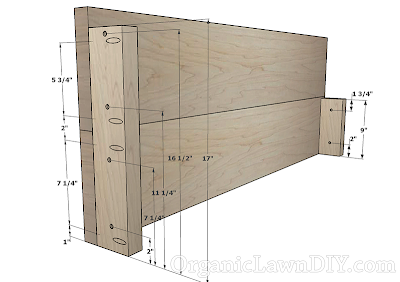 Lay a straight edge up against the sides so that it's resting on the back and front. Draw a line to mark the angle you need to cut for your cold frame. Cut the 1x4's and 1x2's to create the top. 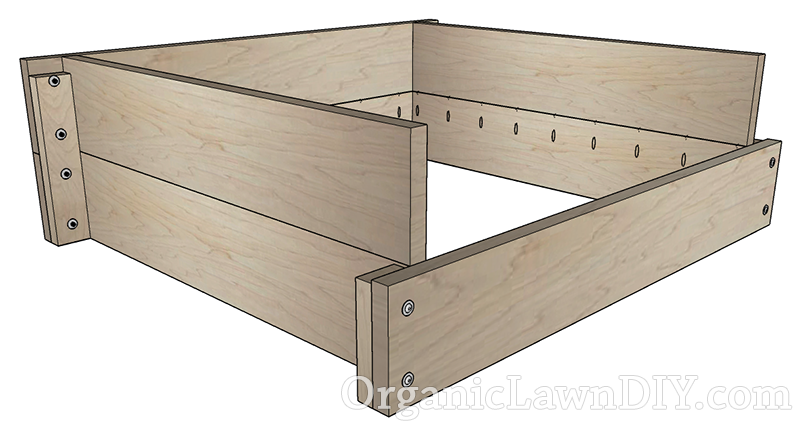 Use 1-1/4" pocket hole screws (and glue after you're sure everything fits) to build the lid. Pocket holes are drilled on the bottom. 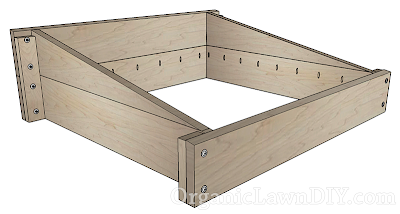 Wrap the top of the lid with the 6 mil plastic sheeting so that you can staple it to the bottom of the lid frame and trim off any excess and corners. 14" in from the sides of the back install one half of the hinges, creating a mortise in the back so the hinge sits flush. 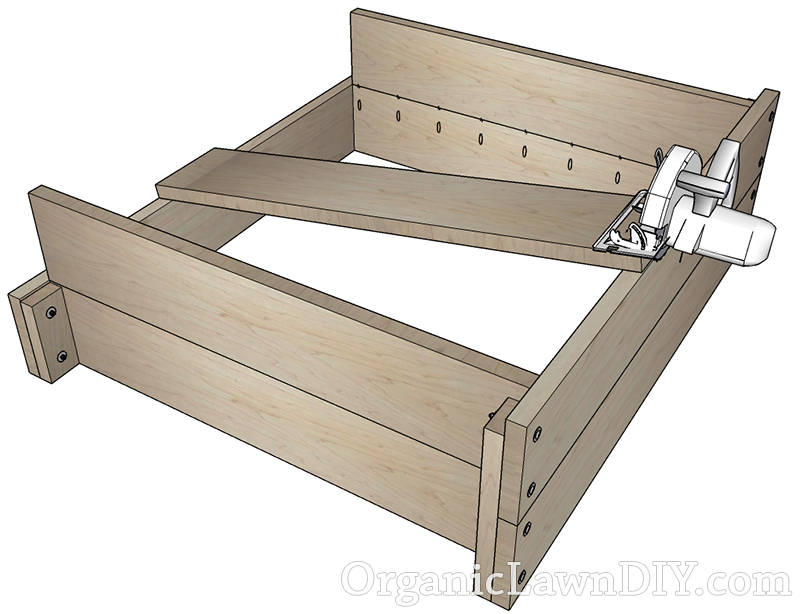 Trim away the plastic from the top where the hinges will go and cut a mortise so they fit flush, then screw them in and attach the lid to the cold frame. Complete the assembly by installing the garage door handle to the front of the lid as well as a hook and eye latch to keep the lid closed. Attach the friction lid supports between the top and the side to keep the lid partially open on sunny days so the plants don't overheat. 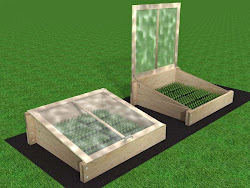 On a sunny day the temperature inside the cold frame could get too hot for your plants. 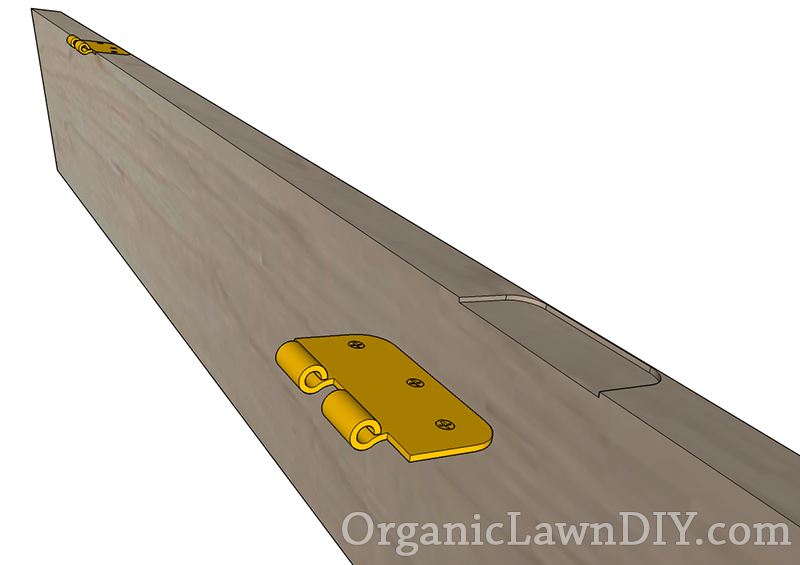 You can open up the cold frames yourself or you can purchase an automatic window vent opener. The lowest price I've fond are from Harbor Freight. When you're not using your cold frames, remove the pins from the hinges so you can detatch the top. Using a nut driver remove the 12 bolts that hold the sides to the front and back. Stack up all the boards and lay them on a flat surface to prevent warping.